Our church's photography team snapped this photo on November 2, 2014. 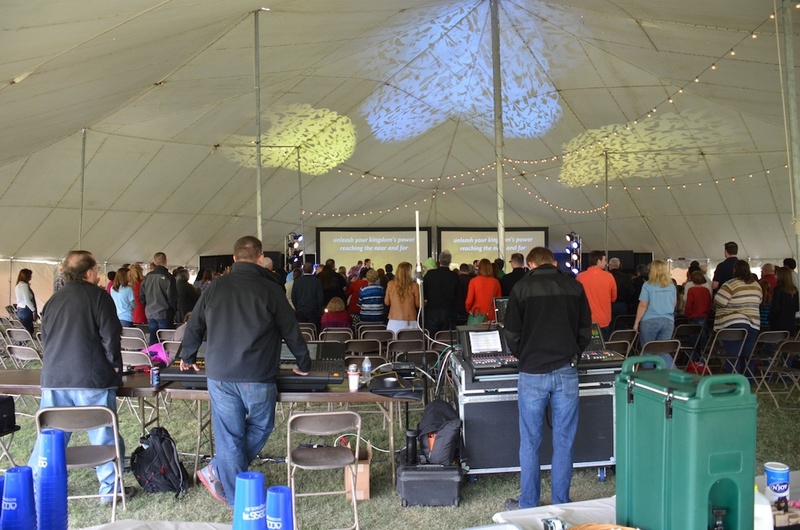 That Sunday we held an Access worship service in a tent on an empty, grassy field where our Worship and Arts Center is today. We imagined the transformation of that empty space into worship space. This fall will mark the conclusion of the 3-year "Imagine" capital campaign to fund that transformation. The scripture from which we took the "Imagine" name, the prayerful process that led to our church expanding its facilities, and the unforeseen changes in Richardson since that time all testify to a God that imagines far more than we can. Before building plans or the Imagine capital campaign came into being, our church had spent months praying, "God how do you want us to grow in our ministry to our community?" We felt God affirming what was happening with Access and other ministries in the church and leading us to expand the facilities that facilitated those ministries. When we began formalizing those feelings into building plans I recall thinking, "Wow! This is far more than I would have imagined on my own." I think others felt similarly, because when we moved to begin the capital campaign we drew the Imagine name from a prayer in Ephesians 3 that refers to God as the one "who by the power at work within us is able to accomplish abundantly far more than all we can ask or imagine." After the building process began and years after the prayers that initiated it, Richardson began a period of explosive growth that continues to bring new people to our community. Back before we could imagine the changes in Richardson, I believe God knew the people that were coming and imagined our church helping them grow in their faith and service to others and used the opportunity of our prayers to set us on a path to have expanded facilities with which to do that. As we conclude our Imagine capital campaign this fall, I hope you will continue to imagine how God can use you and our church in service to our community. I hope that you will pray that God will lead you toward positive impacts that you can't yet even imagine. I hope that you'll invite new people to become part of our church and all it's doing in our community and world. And as you've done in such a faithful way through the capital campaign I hope that you will continue to give of yourself through finances, time, energy, study, worship and service so that the things only God can imagine will come into being through us. I'm looking forward to worshipping with you at Access on Sunday! Shandon and her team will welcome us with smiles and hugs, we'll celebrate our 3rd graders with a gift of a Bible, Julie will preach on being rooted in scripture, and Eric and the Access band will bring us into the presence of God through music. I can't wait to experience it with you!